The readers of The Adventures Continue remember . . . In the early morning hours of June 16, 1959, George Reeves' life came to a sudden and tragic end. For the past thirty-nine years, the official cause of death has been listed as suicide, but almost from the very beginning, that verdict has been in doubt. Although many newspaper and magazine articles have been written and television segments produced in efforts to make some sense of the events of the day, we are still left with only this single unvarnished truth: George Reeves died from a gunshot wound to his right temple in the bedroom of his home at 1579 Benedict Canyon Drive in Beverly Hills. Headlines of the day read: TV Superman Kills Self, 'Superman' Killed By Broken Heart, Superman's Fiancee Has Premonition; He Hills Self, TV Superman Ends His Life After A Party, and Superman Star George Reeves Is Found Dead. Despite the headlines and years of investigation, no one is yet certain who pulled the trigger on the Luger that killed George Reeves. Was it George, himself, or was it Lenore Lemmon, Toni Mannix, a hired professional, or any number of other people who might have been in the house at the time? And why did George die? It is often reported that he was so despondent over his lack of work that he took his own life? But could his state of mind been altered by pain medication and too much alcohol? Was there an argument between George and Lenore Lemmon which resulted in his death? Was he murdered in a jealous rage or perhaps with calculated planning? Was it an accident? Personally, I'm firmly convinced George Reeves' death was the tragic end result of a heated argument. But my conviction is based on little more than a guess and scraps of evidence which can, in reality, point also to suicide or murder. We will probably never know the complete set of circumstances surrounding Reeves' death as they will probably be, borrowing a phrase from an early episode of Superman, forever "shrouded in mystery." Just a quick note to let you know, I will be remembering Tuesday with sadness and continuing to wonder why...how...who. I remember exactly where I was when I found out George was gone. On Tuesday I'm going to take some time to watch some of my favorite episodes . . . "Panic in the Sky". . . "The Golden Vulture" . . . "The Face and the Voice" . . . "Superman In Exile" . . . and the very first episode, "Superman on Earth." I miss him and will never forget. As you know, tomorrow is the 39th anniversary of George Reeves' death. I never did believe, nor will ever believe, that George shot himself. His gentle nature and cheerful personality just doesn't comport with such warped behavior. And then there are all those inconsistencies which occurred on the night of his death. However, I am eternally thankful that George was able to be Superman for us. Everything from his window leaps, to his whooshing flying, to his wall tricks, to his crook-kayoing judo chops, to his rear bumper grabs, to his authoritative voice, his warm smiles, and his trademark no-nonsense square-jaw face, made him a phenomenal Superman and a super man. For all this and more, I'm grateful. Most likely we will never know for certain how George Reeves died, but we do know that he was a marvelous actor and a genuinely caring and kind human being. Not only did he define the role of Superman for the children of the 50s, but he gave his time and energy to many charities, visited children is hospitals across the country, and unselfishly provided meals for underprivileged children. And that's why, thirty-nine years after he left, he is still so very fondly remembered and sorely missed. I've been enjoying reading through quite a bit of this forum (Dave Shutz's Friendly Discussion Board) and just wanted to introduce myself and say how lovely it is to find out that George Reeves is (still) appreciated so much. 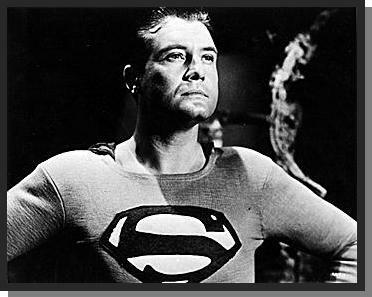 Our family got their first TV in about 1958 when I was 7 or so, and I became an instant fan of television's Superman. However, this was in Australia at a time when America seemed a million miles away. I watched the series in a kind of vacuum as I didn't know any other fans and never seemed to hear anything else about the series or Mr Reeves himself in the media-- in fact I am not sure if there was a proper television magazine in Australia in those days, to have brought such information to us! There was the comics' Superman of course, but I was never allowed to read comics and on the odd occasions I sneaked a peek at a Superman comic I was disappointed to find he didn't look or act like he should-- like George. I remember vividly the sad morning that Dad read us the news of "Superman's death" from the Sydney Morning Herald while we were eating breakfast. (I was eating a boiled egg and had a piece of toast in my hand.) It wasn't a headline at all, I think, not very important news by Australian standards, and I never looked in the newspaper afterwards to see if there was a picture. It seems the paper made a joke about Superman not being invulnerable and Dad read it out-- I was shocked and outraged by it, my earliest memory of such strong feelings. Even then in 1959 George as Superman and Clark had become so much a part of my life, my greatest childhood hero, although at that stage I must have only been watching the show for a year or so. (A child's perception of time!) In solitude I truly mourned his passing and afterwards used to cry at the end of each episode. However, I wasn't fortunate enough to have my feelings validated and so, as I grew up. I think I might have locked away the whole situation into a little compartment in my heart. It's strange to say that nearly 50 years later, it's actually been quite a relief to read on the net that there is doubt surrounding the ruling on Mr Reeves' death, that I have the "permission" of logic to believe it may not have been suicide at all. And this all happened because I was combing the shops for a particular DVD a month ago and was astonished to see George Reeves wearing a big, *colorful* "S", smiling at me from the shelves. It was Series 3 and 4 of TAOS and I had no idea any of the eps were even extant let alone released on DVD! I suppose I had just assumed they were lost because they have not been on Australian TV since the 60s (Several of the Australian and British series from the 50s I liked actually do seem to have been lost.) And I don't think we ever at any stage saw any TAOS episodes in color on Aussie TV. It's funny... when I watched the episodes the first time, I expected that they would be somewhat familiar but apart from the fact that I knew the characters so well, I hardly remembered any of the stories. It's only been since I re-watched the shows several times that I've started to have little flashbacks that remind me that I really did know those particular episodes from childhood. But that's OK-- I've been given the gift of being able to rediscover them almost ab initio. I can hardly wait for the rest of the DVDs to arrive in the mail! In the meantime, I am amazed to discover the extent of George Reeves' film credits. I certainly remember him from some of his 50s appearances in cowboy films, jungle flicks and others, but it appears that I might have failed to identify him in a lot of his 40s pics, at the very least. I rented a copy of Gone with the Wind last week and enjoyed his portrayal of Stuart Tarleton but I think it's going to be a long slow process catching up with most of the other roles-- I will probably eventually have to buy a new TV that will screen NTSC as mine will only show Pal (our local television color format) and I don't think many of his old movies ever will be released locally. But that is something to look forward to later on. And not only have I got all that to look forward to, but the books and CDs etc that are mentioned at this site as well. Thanks again to everyone here for being so informative and enthusiastic. It warms the heart! I was also 11 years old when George died. I do not know when or how I found out about his death, but I remember it was reported as a suicide. These days, George gets flowers regularly! My grandmother and her sister are located 20 feet away from him, so whenever I go to Mountain View, my wife and I cut some extra flowers for him. This is usually Mother's Day, Father's day, my mom and dad's birthdays and a few other days, too. My wife is from another country, and I have explained what George meant to this little kid as he watched Superman on TV 50 years ago. She gets it. I was born in June of 1958 in Brooklyn. I remember very well watching Superman as I grew up. My parents at the time had a huge television set. It was one of those with the old tubes, and you had to wait thirty seconds for the picture to come up. I was spellbound watching some of those episodes. As a boy I was completely thrilled. Through the years I'd watch some of the episodes at my grandparents place in Brooklyn too. I remained spellbound by the whole thing. When I was about seven my uncle told me what happened to George Reeves. He said,"Peter,Superman destroyed himself." I didnt know how to take it. We moved to Cranford, New Jersey in 1965. It took a little while to feel around the new town, meeting and playing with new friends I made and adjusting to a new school. Then one Sunday Dad found this Catholic church.We started going there every Sunday. As I was sitting in the seat, bored, it was time for the ushers to take an offering. They came with the basket, and as I looked up at the one man, my jaw hit the ground. This man looked almost exactly like George Reeves! I looked at him and said to myself, Superman! My eyes were transfixed on this man! At the time I didn't have the nerve to ask, "Are you are Superman?" but I'd always stare at him. It's funny, at that time the only reason I went to church was to see this usher I called Superman. Oh my! Thanks for this informative site. It moved me almost to tears. Gosh, I'm 40 now, and George Reeves will be Superman forever. I'm sure he's flying around someplace.in eternity. Long live George Reeves. 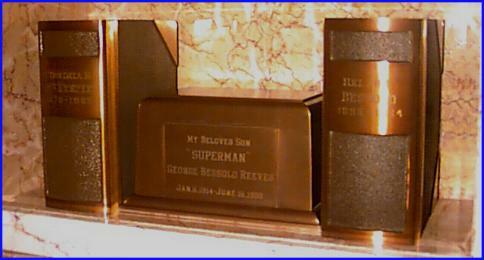 I finally reserved a little bit yesterday to read your George Reeves Tribute Page. What a nice experience. The messages were wonderfully descriptive and poignant, and really hit home with me. It's apparent that so many of us share the same enthusiasm over the old Adventures of Superman show, and the same emotions over the death of George Reeves. Your tribute page gave all a chance to express themselves. The impact that George and Superman had on all of us is truly amazing. That we could all be feeling what we're feeling, forty years after his death, is a true indication of how deeply rooted a wonderful memory can be. When George Reeves died, I was nine years old. While I was still recovering from the shock, I can remember overhearing many adults say that George thought he really was Superman and had jumped out of a window. Many children in my neighborhood heard this same story. I was amazed when I saw it referenced in some of the messages on your tribute page. It appears that this cruel and false story was a nationwide thing. Thanks once again, Jim, and God bless you for keeping George Reeves' memory alive. Your splendiferous page has become an incredible tribute to him. Many believe that the true measure of what we are when we leave this life, is reflected in the legacy we leave behind. George has certainly made his mark. If he could look down and see the good feelings and pleasant memories he's instilled in so many people, and the legacy he's left behind for forty years, he'd surely be proud. This afternoon, I found your old e-mail from one year ago marking the anniversary of George Reeves' death. I can't believe that another year has already come and gone. Discovering your web site and magazine has made up for such a haunting memory. I'm still flabbergasted that there's other folks out there who grew up with the same memories of George Reeves that I did. I remember like it was five minutes ago, Jim. I was playing in the backyard in Hialeah, Florida, and my mom called to me from the back door. A vivid memory if I have any. May he rest forever in PEACE. Hello Jim. My best friend, Allan Nowenstein and I are taking tomorrow off to celebrate and honor the life of George Reeves. Allan is coming to my home at 8 AM, and we are planning on spending the whole day (at least ten hours) watching all the old Superman episodes that I have on tape and paying respect to the man who brought us so much happiness when we were kids and continues to do so now. Sooooooooooooooo thank you again for the wealth of wonderful information you have provided. I hope to talk to you soon. Even though he has been gone for thirty-nine years. It doesn't seem all that long ago for me. I have lived in this town Washington, Missouri all my life and I'm forty-six now. I'll usually take a drive after work and go by the house I grew up in. It's approximately 100 ft. from a railroad. Anyway the house looks exactly as it did when we moved out thirty-eight years ago, prime Superman on TV time. I was shocked as we all were about George's passing, but I was told he leaped from a tall building with his cape on, thinking he could fly. That didn't sound like something a careful George Reeves would do. And when I did finally learn what actually supposedly happened, I couldn't match that with George either. He was concerned with not only his safety, but his fans as well. It's like professor La Serne explained to George in "The Mysterious Cube" -- You might remain forever in that mysterious metal. For me he certainly has. I'll be thinking of George too, even tho his death is still a mystery, his life's work was not and is still there for all of us to enjoy. So tomorrow, I'll be saying, "Thanks George . . . for everything." Just visited your web site--what I fantastic tribute you created for the thirty-ninth anniversary of George Reeves' passing. It is extremely touching. Even though was only six years old when he passed on I still remember hearing the news on the radio that evening. He was quite a performer and I'm sure a wonderful person. Can't believe it is thirty-nine years already. It is indeed sad that his life was cut short. We never know how much time we will receive, whether it's of divine predestination or simply the whim of fate. We must cherish what time we have and try to help those around us. I believe George did just that. He had a fine life. Perhaps not as fulfilling as he would have wished, but I hope he had a beautiful final day. I hope he laughed and smiled and enjoyed his last day on this planet earth. Superman could change the course of mighty rivers, but George Reeves did more than that. He has changed the course of your life and perhaps the lives of many others. For this you owe him a debt of gratitude which, I think, you're repaying. You've shown him all the respect and love that anyone could hope for. I was also eleven years old in 1959, and I remember my mother pointing out the article in the newspaper about George's passing. He was a truly great man. I don't know what really happened to him, but I'm glad he was here. My parents and I always watched Superman and remember George fondly. The tribute you have on your web page touched me deeply. On that day I was nine years old, and I played Superman, like everyone else did. At that time I was living with my dad, at his parents house, since my parents were divorced. My dad, who liked to tease me, asked, "Did you hear about Superman? It's on the news. The announcers on the local station in Seattle were talking about George. It put me in shock. At the time, George was everthing to me -- my role model, father figure (my dad worked all the time and we didn't talked much then, tho now it is better). I remember running up stairs and into my room, throwing myself on my bed and crying. I couldn't believe George was gone. Even at that age I looked up to him, not just as Superman, but as a role model and as a person. I thank God that I have some of his films and television shows to remember him by. Two of my favorite George Reeves movies are So Proudly We Hail! with Claudette Colbert and From Here to Eternity. Tonight I'll watch one of them and some of my favorite episodes of Superman. Thank you, Jim, for being a friend who understands, lets me e-mail, one friend to another. It gives me comfort to know there are others who share the feelings. I was only six on this day in 1959, and the vague memory I have is that of being told by my parents that the actor who played Superman on television thought he could really fly and jumped out of a window. Of course that wasn't true, but all I knew was that my hero was gone. As I sit here now, thirty-nine years later, reading the fond remembrances of George, it shows just how strong his legacy is. 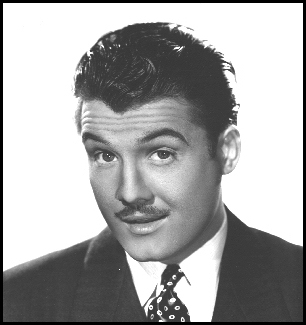 George Reeves is no longer with us, but through your tribute we are able to keep his spirit alive. I hope that next year we can do something very special for the fortieth anniversary. George Reeves is the one, the only, and there will never be another, Superman. Thank you, Jim, for the wonderful tribute page to George. I was a young child when he was taken from us -- but I remember my older brother crying. I think I was too little to comprehend what the word "death" meant, but my mom explained that he had "had an accident and was taken to Heaven". A few years later, when I was ten, my own dad died, and I remember asking Mom, "When Daddy got to Heaven, did he get to meet Superman?" I've never forgotten my Mom's sweet answer, "I'm sure he did. He's probably the one who's teaching Daddy to fly right now. And if you're always a good little girl, someday Superman and Daddy might take you on a flight when you're in Heaven with them." Jim, I'm counting on that! Again, thank you so much. You page made a difficult day a little more peaceful. I loved George Reeves very much, and I miss him always. I know I wasn't born in the 1940s or 50s, but I do remember watching Superman in reruns. Today marks the thirty-ninth year that George Reeves has been gone. George gave us a lot. Everyday when I was about six or seven years old I would stay up late to watch reruns of the Adventures of Superman. I asked my grandfather years later what happend to Reeves, and he told me. George Reeves will always be Superman. And not just for the generation of the 1950s but for every generation that can find the series on the dial. When I was just a boy of four, I shocked my 50-year-old babysitter by stripping down to my shorts, tying my Mom's dish towel to my neck and running around the room with my arms out in front of me. Later, when my Mother came home, the babysitter said, "I think something is wrong with that boy. He was running around the apartment half naked with a towel around his neck, saying he can see through walls and that he could lift cars." "Oh, Dwight is just playing 'Superman,'" my mom explained. "Don't you think that's abnormal?" the babysitter asked. "No, I don't," my mom answered coolly. "And I don't think you're the right person to look after my son. He has an imagination." The babysitter left, never to return. My mom and I watched George Reeves as Superman together. It wasn't for quite a few years that I found out about how tragically George Reeves' life ended. My mom knew, of course. She knew all the Hollywood gossip. But she knew George Reeves/Superman was something special to me. So now here I am, forty years old, and I still get a thrill seeing that special "S" logo that only George Reeves sported. It was different from any other Superman "S" shields and is THE Superman costume to me. Personally, I KNOW George couldn't have shot himself. Repeated performances of creating that fateful night as a mystery weekend has proven time and again that George was murdered. The evidence is there in the coroner's report and can be seen if you act it all out. We all lost a lot that night. George was a special man who breathed Superman with a special magic that hasn't been repeated to this day. I only wish George was still alive so I could tell him how he sparked this weird young boy's imagination, an imagination that has served me well. I'm still weird, only now I get paid to be. And in my heart I'll be forever young. And sometimes, when no one is looking, I'll stand in front of my mirror, arms heroically planted on my hips, reliving those days when I, too, was "Superman." Today, George's remains rest between those of his mother, Helen Bessolo, and his aunt, Virginia McKenzie in California.